The CrossBreed® MiniSlide is intended to offer the user a close riding, very concealable Outside the Waistband (OWB) option for small guns such as the Sig238, Ruger LCP and Rohrbaugh R9. Additional options include a sweat guard for extra slide and grip coverage, or sweat guard with combat cut for slide coverage without sacrificing grip access. 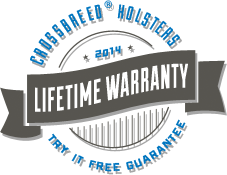 The MiniSlide includes a Two-Week Try It Free Guarantee and is covered under lifetime warranty. Product Size: 7.5" x 1.5" x 3"